The "Holy Grail of Kiss Books"
More than two months before its official release, KISS Alive Forever: The Complete Touring History is already being hailed as "The Holy Grail of KISS books" and was recently one of only two books included in the New York Post's "Things that are IN this fall" write-up. This uncompromising look at the touring history of the most influential live concert act in rock explores the entire arc of KISS's career, detailing every one of the band's 1,810 performances. 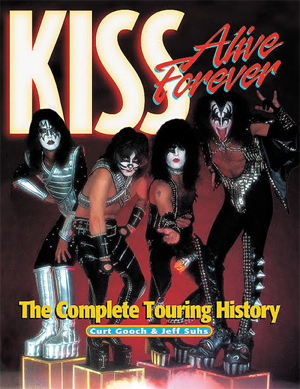 Seven years in the making, KISS Alive Forever is the end result of exhaustive research by its authors Curt Gooch and Jeff Suhs, who reveal hundreds of previously unknown stories and facts about KISS herein. Exclusive interviews with over 100 former KISS employees, friends, and even band members make KISS Alive Forever a thoroughly addictive, immersive experience. The already rich text is brought to life by the inclusion of over 175 color photographs, most of which have never been published before. For the first time, readers will be able to see the infamous 1974 photo shoot where Ace could apply only half of his KISS makeup, as well as several 1970s-era non-makeup shots. KISS Alive Forever succeeds in deconstructing the myths behind KISS's world-renowned concerts and lays bare the underlying story: the compelling tale of four young New York musicians who grew up to conquer the world of rock and left an indelible stamp on American pop culture. Curt Gooch and Jeff Suhs, previously worked together on the officially licensed KISS Trivia Challenge CD-ROM game. The authors will be promoting KISS Alive Forever through personal appearances at KISS Expos and on their official Web site, www.kissaliveforever.com where seven excerpts from the book provide a glimpse of this unique masterpiece.